As the first light of 2015 dawned in Miami I was on the hunt for the rare Key West Quail-Dove. The name is deceiving. Despite being named for the nearby city of Key West, the bird has not been common in Florida since Audubon visited in the 1830’s. At that time it was reported that a hunter could bag a dozen of these birds in a day without too much difficulty. Those days are long gone, and the last 100 years has produced just a handful of records scattered across southern Florida. 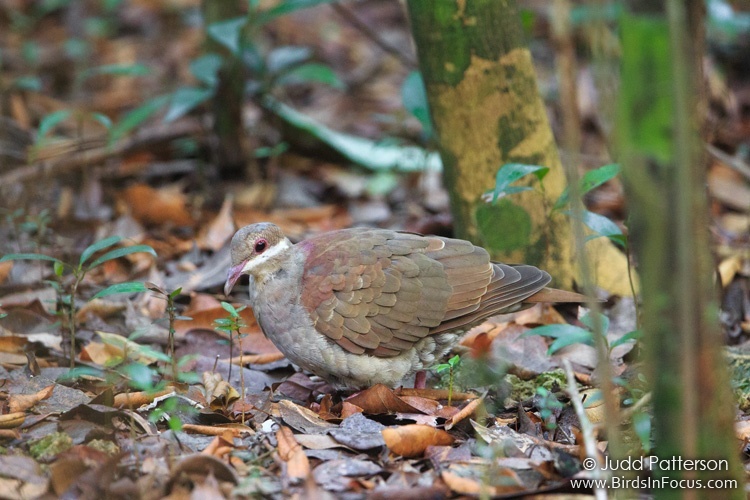 Fortunately the Key West Quail-Dove is still found on islands throughout the Caribbean such as Cuba, Puerto Rico and the Bahamas. The story for this particular bird began on December 28, 2014, when naturalist Rangel Diaz stumbled upon this rarity while exploring the expansive hardwood hammock of the Deering Estate. This beautiful 444 acre property is a mix of historic buildings and gardens along with wonderful mangrove, hardwood, and pineland habitats. While natural vegetation dominates the property, most of it is behind a locked fence due to the archaeological importance of the site. After Rangel’s initial sighting, the estate graciously allowed birders to visit as long as they were accompanied by a park naturalist. 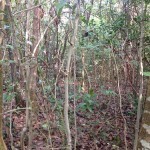 The view into the dense hardwood hammock at the Deering Estate in Miami, Florida. 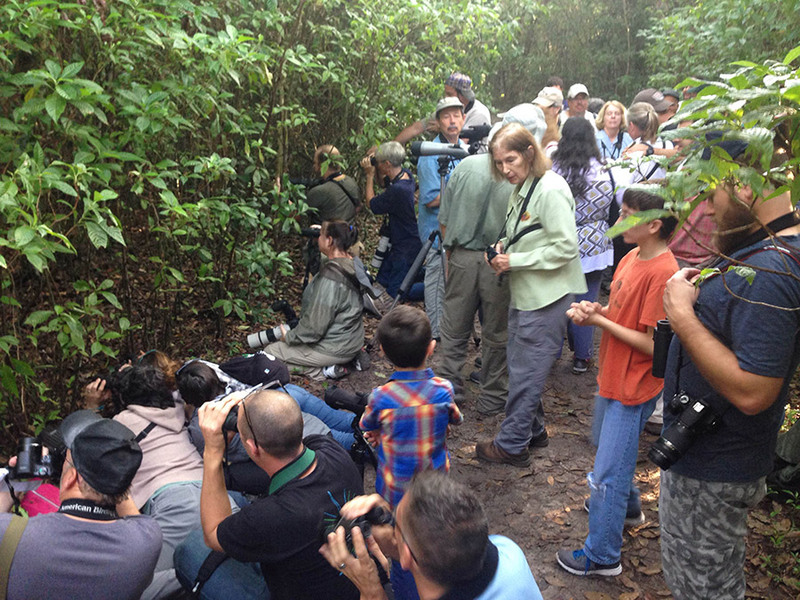 A large crowd attempting to view the Key West Quail-Dove. My first visit on December 30th was a bust. 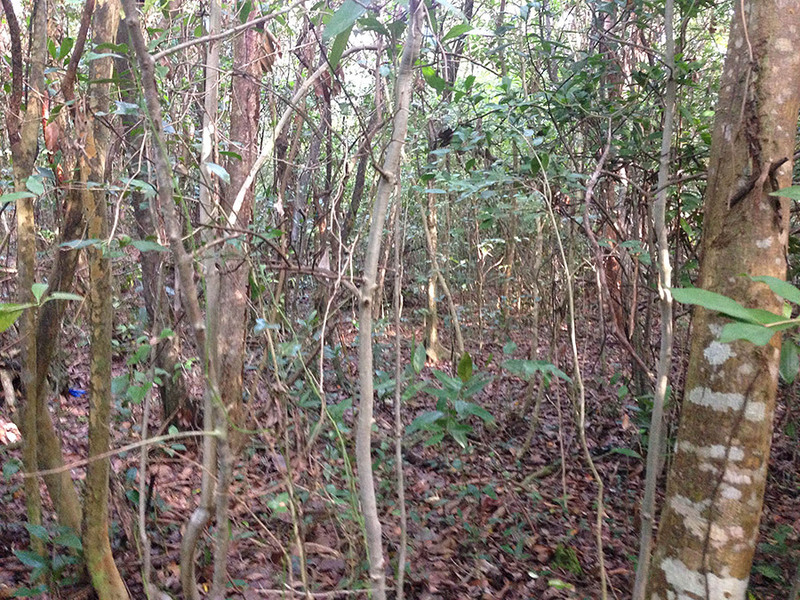 The bird was seen briefly by a couple people, but the majority of the group struck out despite 3 hours of straining to see into the dense vegetation of the forest. We were all quite certain that the bird was right there…under our noses…but his camouflage was most effective! I regrouped and joined the next visit to the area on January 1st. The crowd of 40+ birders was larger than I would have preferred for such a skittish bird, but we were all filled with 2015 optimism. Upon reaching the most recent location, the throng of birders went to work. It was a sight to see as the landscape was scoured by binoculars. 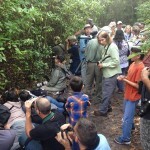 Birders sprawled on the ground, crouched next to trees, or craned their necks to find openings into the complex surroundings. 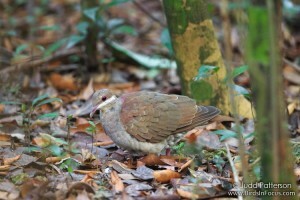 Luck was on our side, and within a few minutes the bird was observed slowly walking through the forest. At one point it paused for at least 20 minutes so that scopes and cameras with live-view could give everyone reasonable views of the superbly camouflaged bird. It was amazing to see that even the bold white stripe across the face could easily be hidden from view when the bird lowered its neck. Satiated with a glimpse of the bird, many of the birders began to disperse. The bird had only afforded a couple of incomplete views, so I really wanted to stay longer. I am sure glad that I did. An hour later the quail-dove began to feed and he wandered into a small opening in the vegetation that was perfect for me to snap a few unobstructed photographs. The light levels were extreme (ISO 6400, 1/30 s) but I managed a couple of sharp images and a new species was added to Birds In Focus! Young male Key West Quail-Dove at the Deering Estate in Miami-Dade County, Florida. Judd Patterson was born in Kansas where he was influenced by the tallgrass prairie and wide open spaces. He has developed a love for travel and has a particularly affinity for endemic island birds.